This morning some ideas popped out! One was to change the La-Z-Boy recliner setup. By rotating the La-Z-Boy clockwise just a little bit, and moving the recliner a little to the left, the entire area there transforms into a much better place! All of the electronic clickers may now be moved from the side table to the top of the 3-drawer cabinet [Still within my easy reach]. The side table [with clickers gone] now has room for MacAir [a major frustration before, when there was no place for MacAir but the floor!]. Before moving La-Z-Boy, Boid's cage was to the rear/right of my view. Now, Boid and myself are not only closer to each other, but able to see each other too. Before, there wasn't a good place to eat meals. And, there wasn't a place to write and do desk things. Our new Table/Desk shall have an easy setup connection to the kitchen counter and a nice leg to match! PS: Pics to follow..... in about a week. Little Honda FIT treated herself to a car wash! Little iPhone and Scampy got their heads together this afternoon. Scampy told iPhone: "It's a really nice awning. Has a crank to lower and raise it and everything." 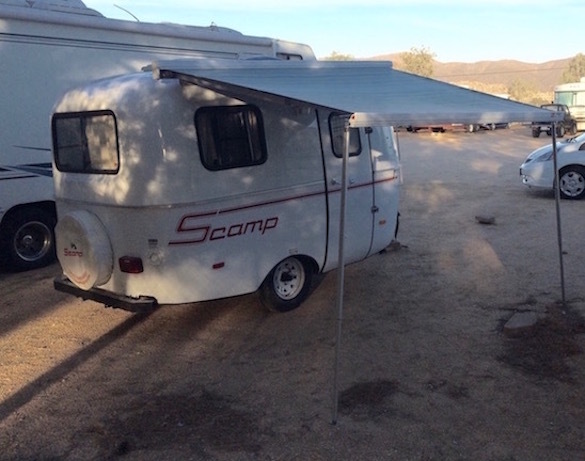 Scampy: Everybody just ignores my lovely awning. Nobody talks about it. Nobody writes about it. Have you ever taken a pic of my lovely awning?" iPhone: No, I haven't. But, we can fix that right now! You setup your lovely awning, and I'll capture the awning in a pic. Then, we'll get together with George to get that pic featured in the Blog's evening edition!" The change that happened by moving La-Z-Boy is very subtle. Hard to take a pic of that so that Reader's understand. But, the change that comes with the installation of the new "Table/Desk" will be significant! Nice to get things all set up and comfortable. Yes! Nice to get it done. And.....nice doing the work to get it done too! Yes, I just looked up "tweaking" in the Urban Dictionary. However, I'm from the old school. "Tweaking" meant something very different in the olden days! I'm with your dictionary, George, the old-timers dictionary! How does Maxwell's compare to 5 Guys? 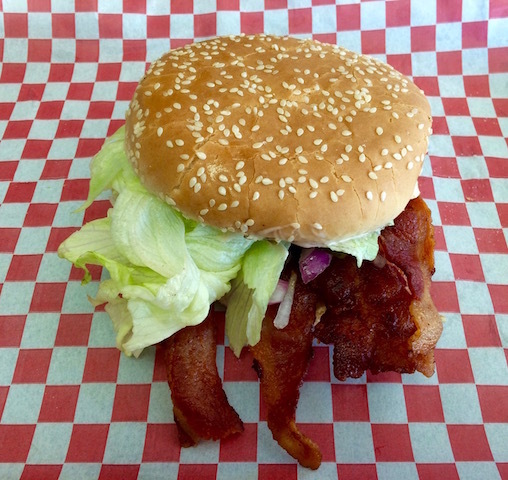 The burger itself at Maxwell's does not compare to Five Guys. However, Maxwell's bacon [as you may view in the pic] is outstanding!